The man accused of killing 50 people in attacks on two New Zealand mosques has lodged a formal complaint over his prison treatment, media say. Australian Brenton Tarrant, 28, has so far been charged with one murder and is expected to face further charges. A source told news website Stuff the prisoner had said he was being denied access to visitors and phone calls. New Zealand is still coming to terms with the mass killings. 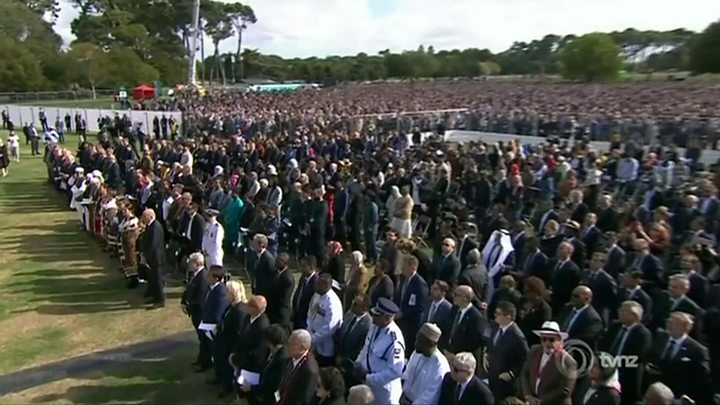 More than 20,000 people attended a memorial service addressed by Prime Minister Jacinda Ardern in Christchurch's Hagley Park on Friday. What are the suspect's reported complaints? The prisoner was flown to Auckland Prison immediately after his first court appearance, in Christchurch on 16 March, a day after the attacks. Stuff says the prisoner complained to the Department of Corrections that he was being deprived of his basic rights, specifically phone calls and access to visitors. One private visitor a week for at least 30 minutes and at least one telephone call a week are part of the minimum entitlement under the the Corrections Act, along with sufficient food and drink, bedding, healthcare and exercise. The Department of Corrections source told Stuff: "He's under constant observation and isolation. He doesn't get the usual minimum entitlements. So no phone calls and no visits." According to the Department of Corrections website, "prisoners have the right to be treated with humanity, dignity and respect while in prison". However, the department can apply exceptions to the entitlement under certain circumstances. Entitlements can be withheld if prisoners are segregated "for purposes of security, good order, or safety, or for the purpose of protective custody". This can also apply if the security of the prison, or the safety of any person, is threatened. What are his jail conditions? A Department of Corrections spokesperson confirmed to New Zealand media that the prisoner had had no access to any media or visitors. The spokesperson said the suspect was being managed according to the Corrections Act and "for operational security reasons no further information will be provided". Stuff says it is thought the prisoner has a door that leads to a concrete yard which he can use for one hour a day. He is said to be "compliant". He has been remanded until 5 April and has not yet entered a plea. He is expected to appear at further hearings in Christchurch via video link. So far just a single count of murder, though more charges are expected. Fifty people were killed in attacks on two mosques on 15 March. Part of the attack was livestreamed on Facebook. A court has ruled the suspect's face should be pixellated in photographs. It is thought he will represent himself in court. How is New Zealand healing? Friday's memorial service carried appeals for the rejection of extremism and embracing of humanity. Ms Ardern said: "We are not immune to the viruses of hate, of fear... We never have been, but we can be the nation that discovers the cure." Farid Ahmed, who survived the attack but whose wife Husna was killed, made a plea for peace, saying he had forgiven the gunman. All 50 names of the victims were read out. They included men, women and children from across the world. The youngest was just three years old.